This weekend project has three basic parts: two wing walls and a center pole with the plumbing attached. All materials are available at the Home Depot. This poolside shower fulfills many requirements: It offers privacy for rinsing off after swimming but is open to the landscape; it is fun for kids and adults; and it is stylish. Interior designers Angelique Swingle and Marcy Voyevod made it happen with Lightscreen panels. Lightscreens are a modern take on traditional stained-glass windows. They employ translucent marbles suspended in an aluminum grid to block views ― but not light. "The manufacturers let you pick marble colors and levels of translucency," Swingle says. "We selected colors based on the colors of the surrounding landscape." Lightscreen panels are available through Architectural Systems (800/793-0224). Design: Angelique Swingle and Marcy Voyevod Design, Oakland, CA (510/433-0724). Bathing outdoors is the height of mountain living, especially when done in a rugged style. 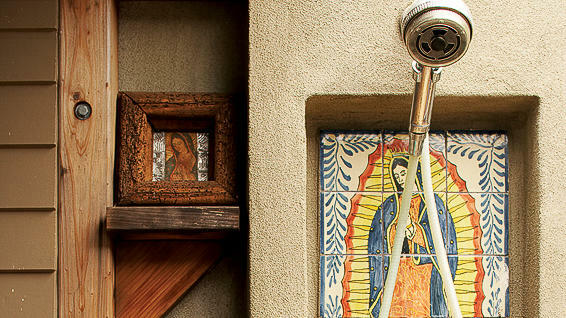 With its rough natural textures in concrete and stone, this two-person outdoor shower, tucked under the overhang off the master bedroom, provides a thoroughly invigorating alpine experience. Rustic materials. Board-formed concrete and a stone floor accentuate the rugged outdoor theme. Privacy and convenience. 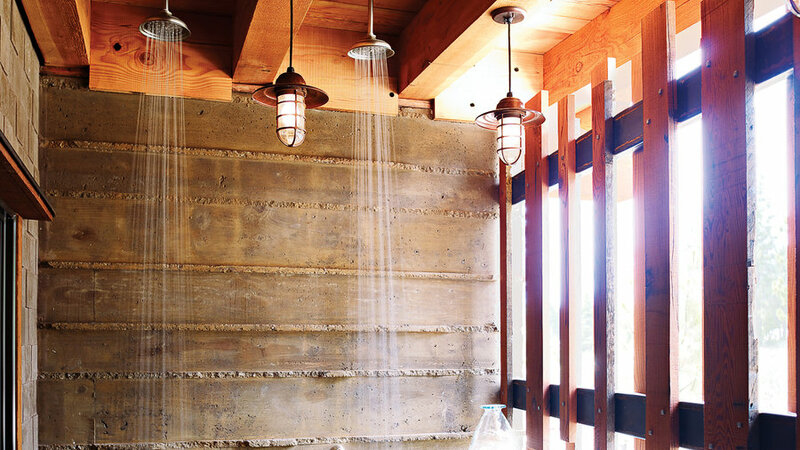 The reclaimed-redwood screen lets in light and air yet supplies ample coverage while showering under Moen fixtures. The low retaining wall adds further privacy and a place for accessories. 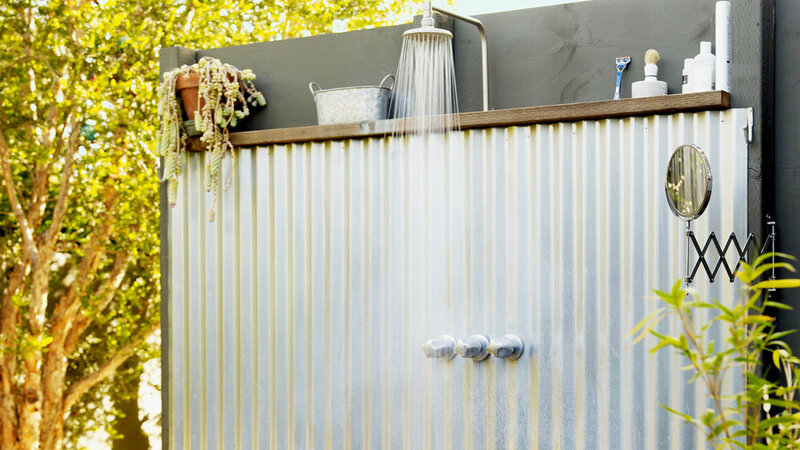 The outdoor shower by Orvis makes for easy post-beach-activity wash down. 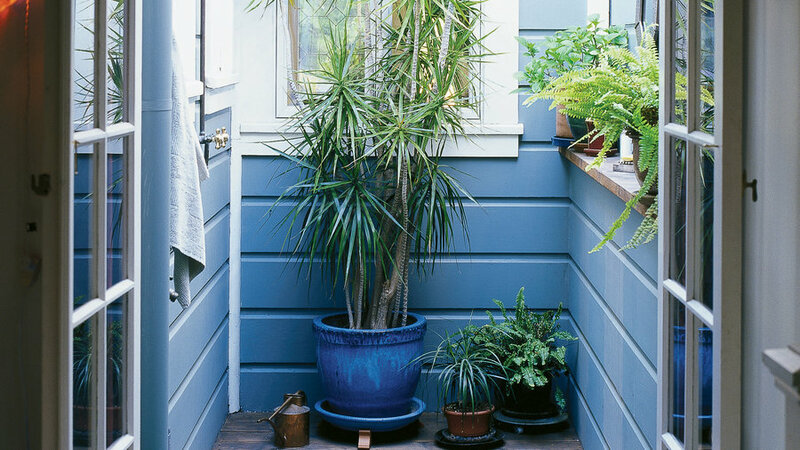 All you need for an outdoor shower can be tucked into little shelves made from scrap wood. 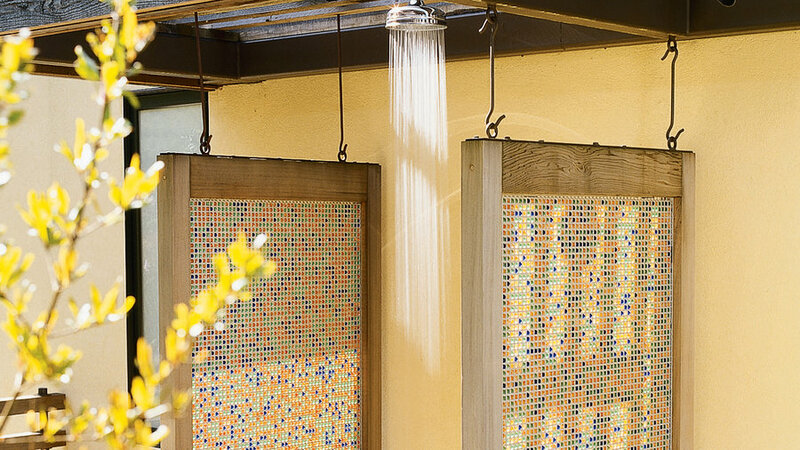 This alfresco shower is hidden behind outdoor lounge-area walls, making it the ultimate private rinse-off spot.